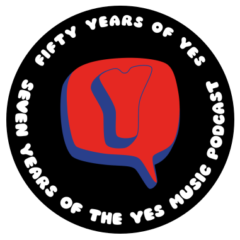 The forty-seventh episode of the Yes Music Podcast featuring the live tracks from ‘Keys to Ascension’. Does the quality keep up in the other live tracks? Are there hints of over-dubbing? Are the band note perfect – and does it matter? Make sure you listen out for two important announcements including a domain name challenge! Listen and see if you agree with me then let me know by leaving a comment or contacting me via the different routes on the right hand side or by leaving a comment below! If you are still listening to the podcast on the website, please consider subscribing so you don’t risk missing anything. You can subscribe with an RSS reader, with iTunes, with the new iOS Podcasts app, via email updates or via www.stitcher.com. oh you’re such a tease…. You know I have the DVD and I’m pretty sure they dubbed a bunch because there times when it seems to me that there vocal parts were off to the video but I’m not a expert just notice but I’m going to watch it again just to make sure. I totally agree with you on your comment about seeing them and yes there getting older and I would not expect Steve Howe to play like he did back in the 70’s thats just dumb its amazing he still can play as well as he does to me that’s the great thing about all those men they are not young and they have gone through the most turbulent time in music history meaning they survived while others have kinda of gone to the waste side. There are a number of bands that may still be together however there music is iffy at best so for myself I know its always a pleasure to hear them play whenever they can. Hi again, Paul. I hope you enjoy the secret live act I’m trying to set up. More news as soon as I can give it out!